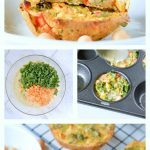 Chickpea flour frittata is an easy 5 ingredients egg-free frittata recipe that create delicious vegan frittata, 100 % gluten free, without compromising on flavor. 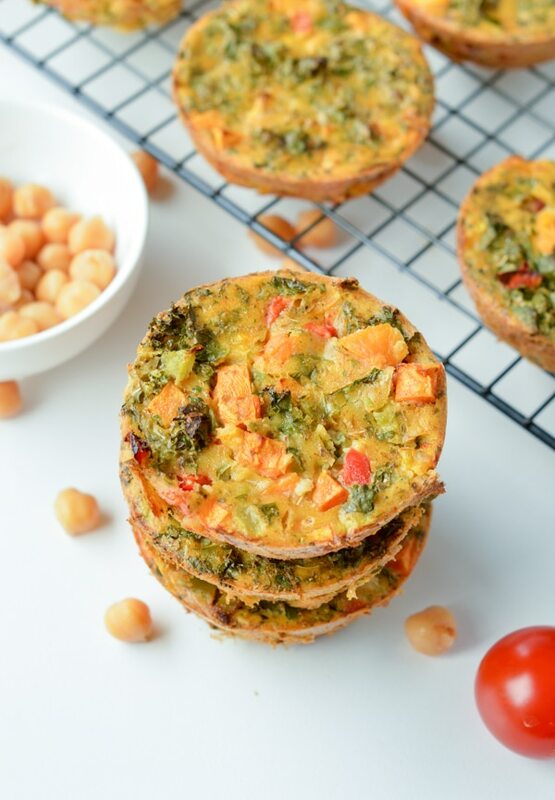 With only 90 calories per serve and 5 g protein those chickpea frittata are perfect skinny breakfast on the go. I am all into chickpea flour right now. I discover that magic yellow flour few weeks ago and I can’t stop myself to cook with it. Since hubby goes vegan this is my favorite flour to use as a egg replacement. I made chickpea flour crepes, chickpea flour omelette and now chickpea flour frittata. If you are not vegan, you probably wonder if it taste great? Well, it does taste like a egg frittata. It has the same egg-like texture with the similar yellow colors. Even my kids won’t notice it was a egg-free frittata made of chickpea flour. Did you know that chickpea flour contains more protein than eggs per serve? There is 22 g of protein in 100 g of chickpea flour compared to 13 g in 100 g of cooked eggs. Amazing right? Another interesting point, there 27% iron in chickpea flour compared to 7% in eggs. 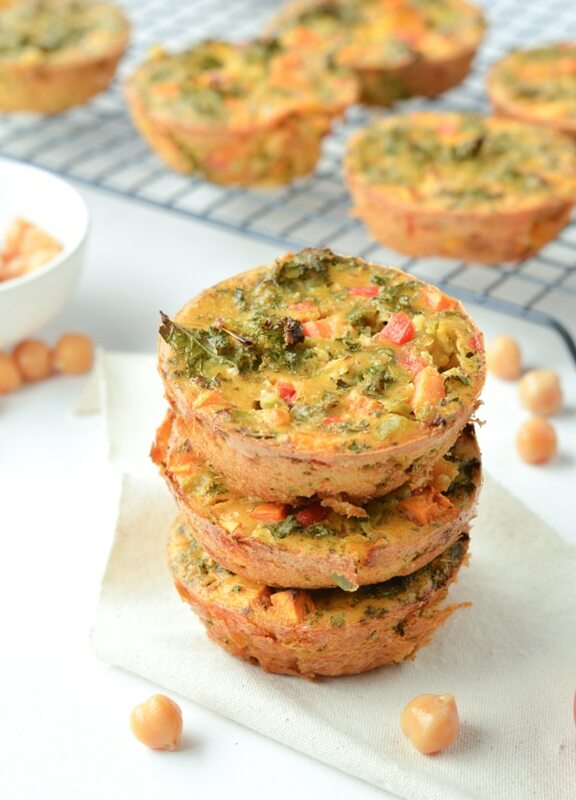 SO enough nutritional talk and let’s jump to this easy delicious chickpea flour frittata recipe. 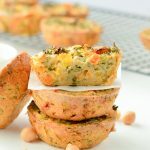 Vegetables mix – I mix sweet potatoes cubes, kale and capsicum but this recipe works with any combo of vegetables, feel free to use your favorite frittata fillings. 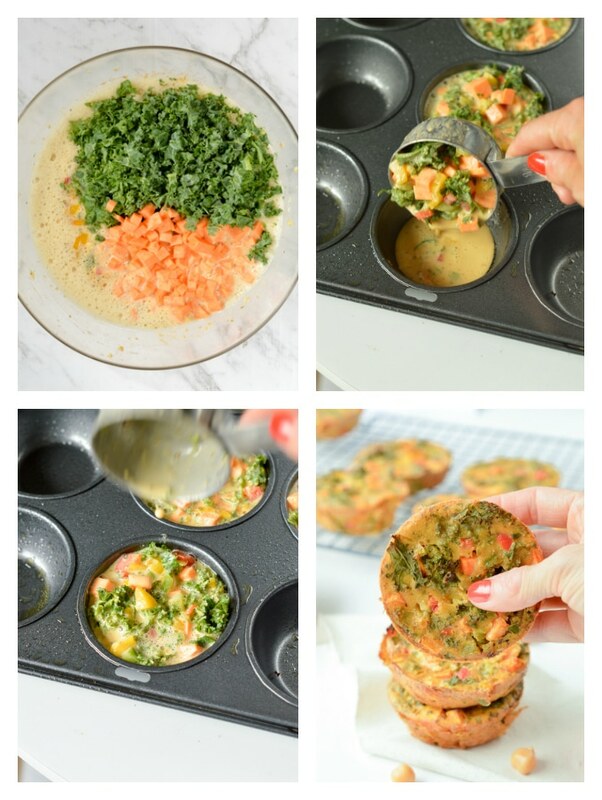 I filled mine with curly kale, cubed orange sweet potatoes and a combo of diced capsicums. The result is unbelievable. It taste delicious, it is easy to freeze, to store and rewarm. There was no leftover and we everyone loves it – even my 1 year old devour its frittata in no time. My vegan husband is in love with this recipe and I made this 3 times already ! So now, you know what to do? Let is get some of this magic flour and make some chickpea flour frittata. Enjoy ! Watch the Chickpea Flour frittata recipe video and make some vegan frittata right now ! 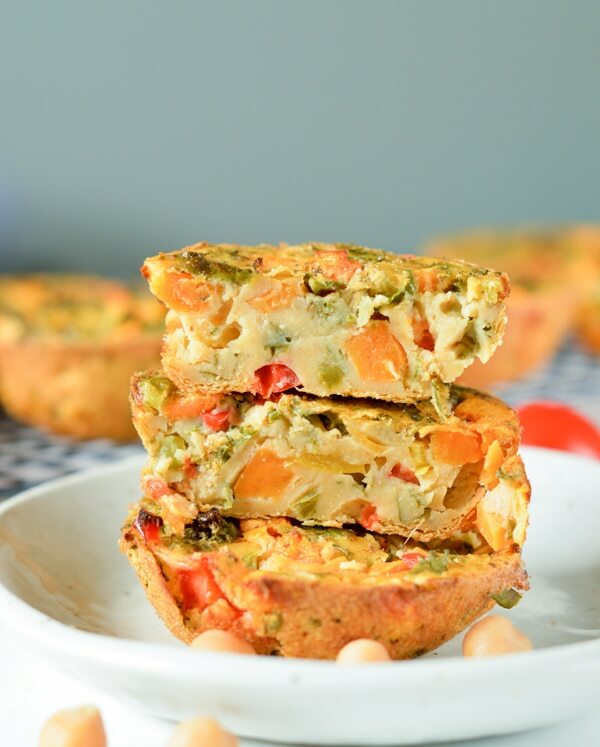 Chickpea flour frittata is a delicious alternative to eggs to create a tasty vegan frittata recipe without compromising on flavor. It is 100 % gluten free, clean eating approved and protein loaded. You are so lovely! I am so glad you love it. Thanks for taking a minute to comment! XOXO Carine. I am pretty sure yes. We always eat the whole batch in less than 3 days. But it should freeze as any regular muffins. Enjoy ! XOXO Carine. Oh, my goodness! I made these this morning and they’re GREAT! Well received by the whole family. The extra are in the fridge, but likely will be eaten later today. A very easy recipe to make. Thank you. I found them a bit bland – will add curry powder or cumin next time. Will addition of baking powder make them less dense? Thanks for your feedback There is alerady cumin, paprika and italian herbs in the recipe. Did you skip it ? I like frittata thick and dense so I did not add any baking powder but I guess it could help with the texture if you like fluffy frittata. Thanks for trying ! Carine. Hi there , I found this very easy to make, but agree with Carol, a bit bland, I followed the recipe to the letter. I will definitely be making it again but will add loads more flavour. Perhaps tomato pure, some lemon juice and chopped coriander. I agree, adding chopped herbs or tomato paste is a great idea. I usually serve those frittata with tomato paste sauce on side and a green salad to add some flavor into my plate. Thanks for your lovely comment. XOXO Carine. Looks so good, thanks for sharing this recipe! My pleasure! I hope you like them. XOXO Carine. Is it possible that you could post the macros per serving please? 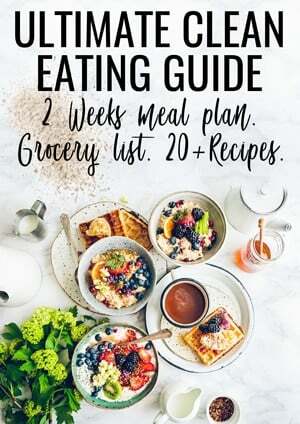 I’m going to make these but trying to track my intake! Hi Jamie, scroll down after the recipe box and you will see the full nutrition panel per serving. Enjoy the frittata! XOXO Carine. I tried these this morning and they are great. 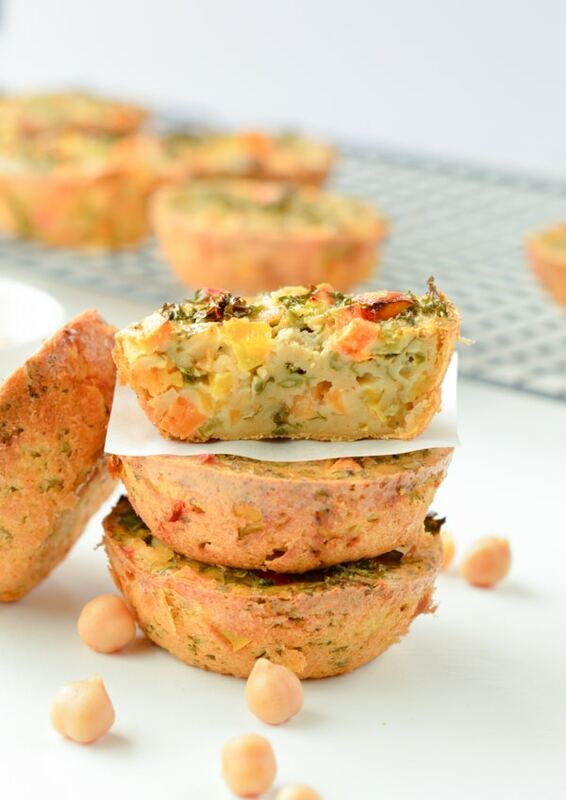 Any thoughts about about how to make this in a bigger dish vs. in muffin tins? I am thinking pie like slices. Thank you so much! Yes sure! I do large large frittata with this recipe in a 26 cm pie dish with no problem. It makes a nice brunch or dinner that all the family loves. Enjoy ! Carine. These are AMAZING!!! I am so glad you posted this! I had some left over batter so my daughter suggested that we throw it in the waffle iron. It worked! Best Mickey Mouse Waffle ever! WOW! That is a great idea, I will definetly try the waffle idea. My kids loves waffles too so this is good to know I can reuse the batter in my iron. Enjoy the recipes on the blog. XOXO Carine.